Album number three for Malta's doomsters brings more of the same kind of no-frills, straight forward doomy heaviness that the first two albums brought forward. Their style is not exactly true doom as there are strong elements of the slower tempo traditionals such as Manilla Road to be found in here as well as the typical doom of say a Saint Vitus or a Candlemass. The one band campaign to put Malta on the metal map, Nomad Son have done it with a series of very solid albums that are not so much flashy as they are consistent. The production is pretty decent and the band do a good job composing the tracks to send their message and can combine a good guitar riff, with some atmospheric keys and a good rhytm going all tied together with the tight vocals of Jordan Cutajar to bring forth their stories of death, Christianity and of course doom! I won't go through and list the individual tracks on here because there is no filler on this CD. From the beginning of Light Bearer and all the way through the ending Epilogue there is hardly anything on here that doesn't work. 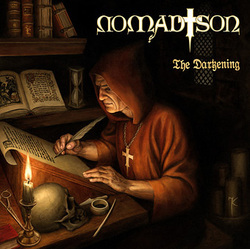 Nomad Son just have a way of writing some really killer doom that would do Candlemass, Trouble and all the forefathers proud. They are not flashy as I said earlier, but they prove you don't need to have a lot of flash to put out some really killer music, particularly in this genre anyway.